The Vikings plan to work out Bo Levi Mitchell, the Calgary Stampeders quarterback who led his team to Grey Cup championships in 2014 and 2018. The Vikings have had some success over the years finding players from the Canadian Football League who could contribute to their NFL roster. They’ll take a look at one of the bigger stars in the league during a workout on Wednesday. 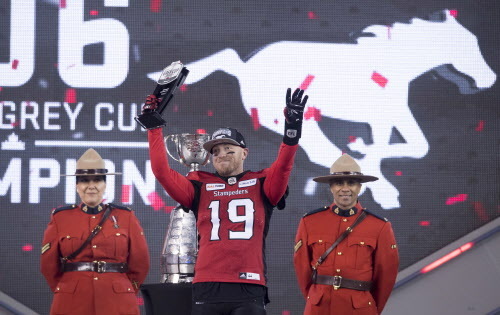 The team plans to work out Bo Levi Mitchell, the Calgary Stampeders quarterback who led his team to a pair of Grey Cup championships in 2014 and 2018. Mitchell, who helped Eastern Washington to a FCS national championship in 2010, has won a pair of Most Outstanding Player awards in the CFL. If the 6-foot-2 quarterback does enough to earn a contract from the Vikings, it’d be on a futures contract similar to the one the team gave Brandon Zylstra out of the CFL in January. The 28-year-old Mitchell would have to compete for a roster spot in 2019, but could push Kyle Sloter for the No. 3 job, or be in position to benefit if the team decides not to re-sign pending free agent Trevor Siemian. At this point, the Vikings are doing little more than taking a look at Mitchell, who is expected to gauge interest from a number of NFL teams, but if the team decides to sign Mitchell, it could have an interesting prospect for its quarterback depth chart down the road.